We (my kids really) have been on the GAPS diet now for a year and a half. The diet was introduced to me by a friend who was reading the book as a possible cure for her husband’s IBS problem. As she was reading it, my drummer boy came to her mind, so she shared the book with me. The book was written by Dr. Natasha Campbell, a neurologist, who gave birth to an autistic son. In all her medical knowledge, she could not heal her autistic son, so she studied nutrition. Through nutrition, her son is now healed, or as she calls it “recovered” from his autism. As I read the book, the Lord gave me such a great conviction to implement this diet that I could barely stand not to do it. My husband and I decided to put all of the kids on it and eat it ourselves (when we are with them). Implementing this diet has been quite a challenge in discipline, organization, and self control. The diet consists of 3 phases: the introduction, the full diet, and coming off the diet. In a nut shell, the full diet does not allow processed food, sugar, or grains of any kind. The bulk of the diet is soup made of homemade broth, boiled meats and animal fats, and vegetables fermented and raw. Eggs, dairy, and nuts may also be eaten if there is no allergy. We started implementing the diet slowly so as to get our kids used to the new flavors of food they were going to have to eat. I simply did not purchase any more non-GAPS food items, and once all of the non-GAPS food ran out, we were on the full GAPS diet. After the kids were used to the full GAPS diet, I put them on the introductory diet for 3 days. Then, we slowly moved back into the full GAPS diet. Implementing this diet, was probably one of the toughest things I have ever done. The twins were especially resistant to the chicken broth and I literally thought all of my kids were going to starve. Thankfully, hunger overrides. It also took a lot of organization on my part. We live 20 minutes from town and most of our errands happen in the city which is a good 45 minutes away. I have to always have food prepared to take with us when we leave the house. This means that I always need to know where we are going and when we were going. 4 out of 5 kids are, thankfully, happy to have the same breakfast each morning. Pancakes, consisting of bananas, or squash, eggs, and peanut butter all mixed together in the vita mix and poured onto the hot griddle. The other kid usually has left over meat with homemade GAPS ketchup. Lunch always consists of the soup: homemade bone broth with cabbage, carrots, onion, and left over meat. At this time I start boiling whatever meat we may be having for dinner. I often will start this before breakfast in the crockpot as well. Snacks: Nuts, fruit and raw veges, as well as freshly made juice from the juicer (carrots, apples and greens). Dinner: Lettuce wraps or salads with the meat I have boiled. Bones are usually always boiling in water for the broth by this time. Desert: Peanut butter or yogurt with honey or strawberry ice cream made in the vita mix with frozen strawberries, honey, and milk. I always make peanut butter cookies made with honey and coconut flour to take to birthday parties. Outings: Banana muffins, or pumpkin bread, both made with coconut and almond flour. And of course, nuts, raisins and fruit are quick to go items. I am amazed at how the Lord has provided for our family to eat this diet, which consists of food priced well beyond our means. We have an organic produce farmer just around the corner from us who sells us bulk veges at an incredibly low cost for organic food. A friend from church raises, and processes, all of our meat: lamb, beef, goat, pork, and chicken as well as goat milk, also for an incredibly low price. Probably our most expensive items are the nuts and the out of season fruit. And the healing has been incredible! My drummer boy, who could barely speak a coherent sentence, is now hearing himself, hearing me, correcting himself, and asking for corrections. He is thinking and learning better than ever before. He is able to sit still and concentrate for longer periods of time and he hasn’t had a migraine in 5 months (He used to get two to four a month, since birth!) His face is rounder, not gaunt, and his stomach is no longer distended. My ballerina no longer snores (I had no idea this diet will cure that) and she also concentrates better with a longer attention span than before. The twins are calmer and generally healthier. And they all look amazingly healthy and have a great amount of healthy energy. Everyone that knows our drummer boy has commented on the tremendous improvements he has made on this diet. 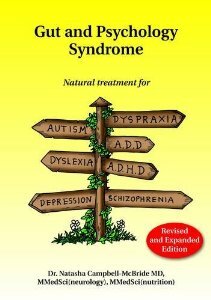 I highly recommend this diet for anyone with an autistic child or any child with learning disabilities. The book is full of scientific proof that bad stomach bacteria will block learning and actually causes an opium effect in the brain. Grains and starches are a drug to these children. Heal the gut, heal the mind. It is our duty as parents to be diligent in providing the best for our children. It is hard, but it does work!